Welcome to St. Albert Sports Academy! Learn how your kids can experience a new adventure every week! Welcome to Greater St. Albert Sports Academy! 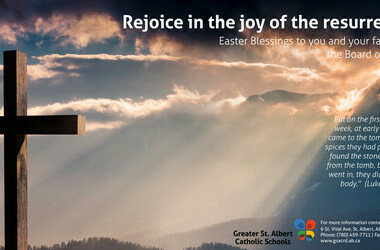 The Board of Trustees extends their blessings to all staff, students and their families and are pleased to share with you a video message from His Grace, Archbishop Smith, An Easter Blessing.